DIS Magazine sat down with artist and rising star Liz Magic Laser on the set of her recent performance and installation, Absolute Event, at Paula Cooper Gallery to discuss everything from the aesthetics of power, to the perils of audience participation, why Edmond Rostand’s 1897 play Cyrano de Bergerac has never been more relevant, and what focus groups have in common with disco. Laser, who deftly combines live performance with video projections edited in real time, has built a cohesive body of work using the same strategies most often co-opted from the performing arts by politics, the media and big business to reveal the very techniques they routinely use to construct and manipulate contemporary culture. As performance, installation, video and works on canvas her pieces offer insight into topical collective experiences with a chronicler’s intelligence, one she shares with both Ryan Trecartin and Jon Stewart (yes, of The Daily Show). Simultaneously, Laser’s work is grounded through a timelessness and sensitivity to the longue durée, which reveals itself through nods and winks to the historical works woven into her project. Having recently acquired used equipment from a television studio, Laser, along with Ryan Trecartin and New York based artists Trisha Baga and Alina Tenser, is at the forefront of a group reflecting on the fabric and currency of contemporary visual culture through performance, video installation and mixed media. Liz Magic Laser has been exhibited world-wide, most recently at Westfälischer Kunstverein, Münster, Germany (2013); Mälmo Konsthall, Mälmo, Sweden (2012); the Moscow Museum of Modern Art (2012); The Studio Museum in Harlem, New York (2012); Performa 11 Biennial, New York (2011); and MoMA PS1, New York (2010). In 2013 she was the Armory Show’s Commissioned Artist. Look for Laser to continue her exploration of the relationship between politics, news media, and the public in Bystander, the next phase of her forays into television news. Bystander will be developed January 9th – March 24th during a forthcoming residency at Recess, the artists’ workspace fast becoming a crucial member of New York’s non-profit incubators of contemporary art, and will culminate in performances March 27th – 29th, 2014 at downtown’s éminence grise of experimental performance, The Kitchen. David Andrew Tasman Absolute Event, your current performance and installation at Paula Cooper Gallery, brings into focus the hegemony corporate entities, politics, and the media wield over content transmitted to the public – what’s at stake for you in this project? Liz Magic Laser Looking at how corporate culture is being produced, how political leaders and business leaders are being produced – that’s been my investigation for the last few years. Your question about what’s at stake is always a guiding question for me but it’s also impossible to answer without sounding overly grandiose about what you think an art project can do. Definitely that kind of question is ever-present for me, but I can answer better with the work than I can in words. DAT Do you see the production of commercial culture and the production of politics through the same lens? LML It’s all being produced the same way, which makes me think it’s a worthwhile project, to parse out the aesthetic techniques and communication strategies for wielding power. At the end of the day, the way cigarettes and cake batter are being marketed to people is the same operation going into constructing a [public] persona or [political] platform. The guiding principle now is appealing to the lowest common denominator. DAT In Public Relations there was an emphasis on the vox pop interview, and in Stand Behind Me the hand and body gestures that accompany political speech-making were presented in isolated focus. What are you taking apart in Absolute Event?? LML For Absolute Event I found two actors, Daniel Abse and Gary Lee Mahmoud, who actually worked on Capitol Hill before turning to acting. Since I was developing a script about a political strategist coaching a politician, I interviewed the actors about their experience as congressional staffers in addition to interviewing political and communication strategists. The final script combines this material with dialogue from Edmond Rostand’s play Cyrano de Bergerac (1897). I was writing the script during the government shutdown in October and wove in quotes from the rhetoric flying around in the news. I made the two-room gallery into a set comprised of a conference room and a control room. During the performances I made a live-feed video, which was filmed, edited, and projected in the control room. Ten audience members were asked to register moment-to-moment approval ratings using Audience Response System devices. This generated the data reflected in graphs that appear in the video. I wanted to bring market research into line with the study of the well-rehearsed performance of politicians. What I heard across the board from meeting with a number of political strategists was that you have to stay on message, you shouldn’t get thrown off by actually answering any questions, you just have to bring the answer back to your message. DAT That became very apparent in responses that the audience’s unscripted questions elicited from Gary, the ‘Leader’ in Absolute Event. LML On Thursday it got out of hand when I didn’t expect that much participation. People thought everyone was a plant. DAT It was difficult for me to tell as well. DAT I imagine that is a common experience in the production of live television. LML Yeah…The stage managing of the audience – that was something I was definitely interested in Stand Behind Me. Absolute Event represents the confluence of a few different strains that I’ve been working on. After doing some process oriented things with market researchers and political strategists I had all this material to work with, to weave into something, so I was really looking back at workshop footage and notes from prior projects and knew that I wanted to develop a script where a strategist was puppet-mastering a politician. It’s not exactly a representation of how I think things are, but more about the bizarre pseudo-science of wielding power that appears to be at work. DAT In Absolute Event Audience Response Systems are used to gauge approval or disapproval – are the questions in the devices put together by political strategists? LML And by services catering to them. A lot of these Audience Response Systems are made and programmed by native Chinese speakers. There were a lot of spelling errors in the questions on the Audience Response System device that I started to correct, asked the service to correct, but then I held back on it. I corrected some spelling errors and phraseology, but I also wanted some errors to slip through because it’s telling: market research or political strategy is like an alchemy, not a linear science…but so much credence is given to it; it’s what’s determining how a politician or business leader dresses, their cadence, how they behave, or who they associate themselves with. The behavior and decisions of the most powerful figures are being determined by this pseudo-science! DAT That kind of says it all! LML That does say it all! DAT What role does the history of dramaturgy and its relationship to political engagement play in your works? LML I guess I’m using theater as some sort of solvent or catalyst for another context. I have been increasingly interested in the figure of the dramaturge, who is in a way the equivalent of an art historian. The dramaturge is a drama historian who helps the director and the actors as an interlocutor for all aspects of the production. She has the academic background and will go and research what kind of clock they would have on the Titanic and all the historical details that bring credence to the construction of a reality on stage. I am really interested in how political advisors and whole teams of people, or communication strategist for corporations, play this kind of role in analyzing, researching, and then advising on policy and public behavior. Theater was the dominant form of public entertainment for tens of thousands of years until the advent of cinema. Theater is not about to disappear, but it’s not holding as essential a role in the average person’s life as it did before the 20th century. I’m really interested in how the techniques from theater get mimicked in politics and business. I think it’s noteworthy that the practice of politics and big business is becoming predominately an aesthetic practice. Meanwhile, the art world is a bit insular and sets itself apart from dominant culture. It seems to me there must be some way that the people in the arts could be participating or intervening in the dominant culture in some stronger way. I don’t know exactly how that happens or what that looks like, but I’m trying to imagine that. The dominant culture in this country seems somewhat ruled by pandering to a projection of what will appeal to the most people. What you see on a news program or in the situation room at the White House, I think, is a mutant form of performance, costume and set design. And, how politicians dress, it’s actually in somewhat low taste on purpose, because advisers are trying to make these figures appealing to the majority of Americans. LML If you look at JFK-era politicians, journalists, and news anchors, they’re not as concerned about not coming off as elitist, but now a lot is guided by appearing as an everyman or everywoman so you can maximize your appeal to the greatest number of people who will identify with you. LML Well, there is a taste judgment inherent in it…which is problematic. DAT Yes, it seems to conflate the benefits and the problematics of direct democracy. LML It’s an instrumentalization of the appearance of democracy, which I think is actually working to placate people so that they actually work against their own interests. DAT Is that why you chose Cyrano de Bergerac as one of the references for this project? LML I initially thought the scenario would involve a TV producer controlling a political talk show host who is interviewing a politician who is in turn being puppeteered by a strategist. Then I thought, “this is reminding me of some classic theater piece,” and I remembered Cyrano and it just seemed like the perfect fit. The lines that Cyrano feeds to the young lover, Christian, are a very eloquent virtuosic love oration about the need to do away with fancy words. The farce derives from its hypocrisy. The oratory is a critique of the very thing it is doing, and so it seemed all the more ripe for me. Cyrano is trying to help Christian because the young guy isn’t able to perform on his own. The love object for both of them, Roxanne, is only turned on when she is being wooed with the most eloquent words. The men “give her what she wants” while simultaneously trying to persuade her to get beyond the aesthetic trappings of courtship. The goal being to get past the talk and seduce Roxanne. DAT I see…In Absolute Event you transform Cyrano into the ‘Strategist’ in the control room who coaches Christian, now as your ‘Leader’, through a concealed ear piece…amazing. LML I am interested in keeping the reference material intact to a degree – but it’s not really about that…they are references I want to be in dialogue with, not pay homage to. DAT How has working in the space at Paula Cooper Gallery influenced the production of the work? LML In a way it’s the first time I’ve been able to apply this method to a gallery setting where I feel I worked with the context or premise of what an art installation is in a theatrical manner – so it was both a stage set and television studio, hybridized with an art show. It’s a real mash-up of several things I’ve been working on – it’s a riff on the conference room, a setting I used in two projects earlier this year at DiverseWorks in Texas and for the Armory Show. I was also researching war rooms and found that the situation room nowadays is really just a corporate conference room. 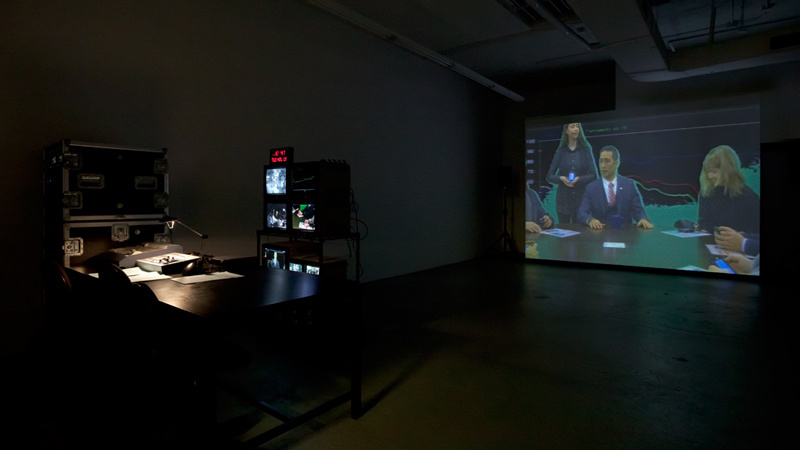 The gallery set ended up becoming a hybrid between a television news studio and a corporate situation room. DAT What’s up with all the disco references? LML I used the disco thing as representative of the hippie-era ideals of “peace, love, and freedom” – which sound pretty similar to political rhetoric. Disco is often pointed to as the commodified incarnation of hippie culture, though I wouldn’t want to totally write it off that way. Last year I went to a version of the original disco party – I thoroughly enjoyed it and it’s probably what got me thinking about disco. David Mancuso started that party – the first one was in 1970 and was called Love Saves the Day. They still do it two or three times a year, but it’s hard to get an invite! I went maybe a year and a half ago and that probably started me off thinking about disco because it really seemed like an idyllic party if I’ve ever been to one – where it was all ages and felt like so many different sectors of society of New York…it felt like your whole subway car getting down together. The idea with that original disco party was that it was not going to be a commercial party: you would bring your own alcohol and your own party goods, and it’s still that way. The Studio 54 disco phenomenon that followed is what I’m using in the installation to reference disco as a commodified counter-culture. I watched things like The Last Days of Disco while working on the script. The set idea of creating a hybrid space for public revelry and social communing also grew out of the show I did last summer in Germany, Public Relations. For the Paula Cooper show I wanted to merge the disco reference with the conference room ’cause it’s also a site for commodified communing, dialogue, information gathering, and assessment. For more info please visit: http://www.vapour-trail.com/. All images © Liz Magic Laser. Courtesy Paula Cooper Gallery, New York. Photography Steven Probert. 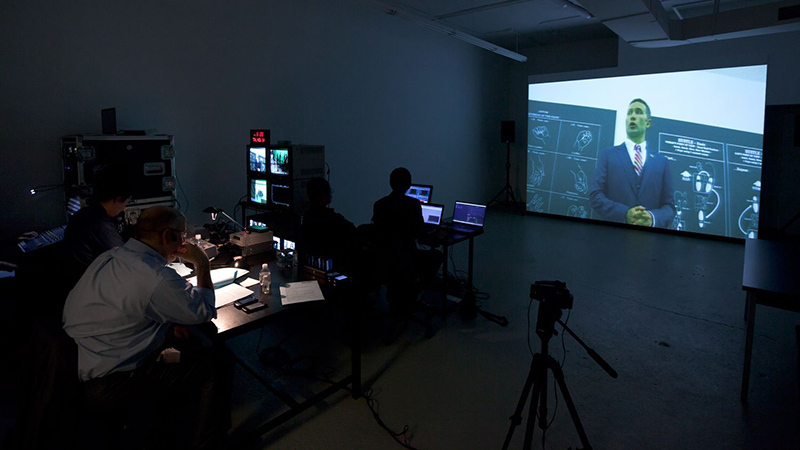 Absolute Event, Liz Magic Laser, 2013, performance and video installation, 45 minutes, Paula Cooper Gallery, New York. 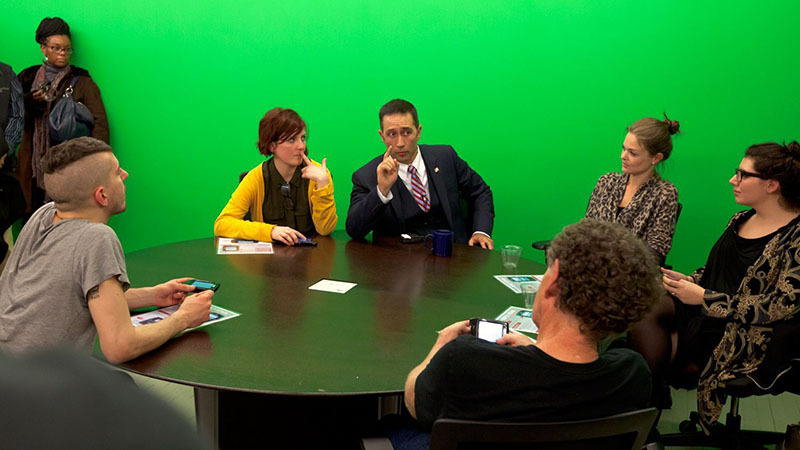 Featuring actors and former congressional staffers Daniel Abse and Gary Lee Mahmoud. Credits: Script written by Liz Magic Laser in collaboration with Sofia Pontén, based on Cyrano de Bergerac by Edmund Rostand; Set Design in collaboration with Andrea Huelse; Script Advisor: Political Strategist Mustafa Tameez; Technical Director: Irwin Seow; Director of Photography: Laura Cooper; Audio Engineer: Tristan Shepherd; Costume Stylist: Felicia Garcia-Rivera; Research Assistant: Rachel Zaretsky; Production Managers: Lucia Hinojosa and Brian Mcelroy. Special thanks to Paula Cooper, Anthony Allen, Lucas Cooper, Jake Ewert, Kristoffer Haynes, Alexis Johnson, Margaret Kross, Steven Probert, David Guinan, Sanya Kantarovsky, Ken Laser, Hanna Novak, Wendy Osserman, Romy Scheroder, Esther Kim Varet, Joseph Varet, Plum TV and The School of Visual Arts MFA Photo, Video and Related Media Department. Produced with support from Paula Cooper Gallery.